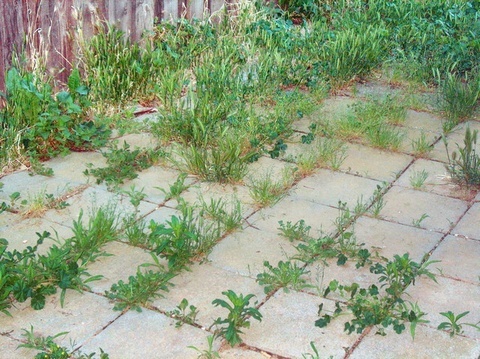 Weed control can be the bane of gardeners’ lives if you have weeds that continually pop up year after year. Wouldn’t you love to dispatch them quickly without harming the environment, good bugs and wildlife in your garden? Synthetic herbicides have a greater potential to contaminate surface water so if in the past you’ve succumbed to using systemic herbicides, here’s a good reason why you should put that down and pick up something better. The sprays mentioned were those with (a) Acetic acid (vinergar) and salts. (b) Pine Oil based. (c)NEW, "Slasher" based on Nonanoic which is also called Pelargonic acid and occurs naturally as asters in the oil of Pelargoniums. The advantage of "Slasher" is that it can be used on cloudy days and during winter. Acetic acid sprays rely on sunlight to burn or dessicate the plant you spray it on. One thing to remember, these are knock down herbicides which doesn’t remain in the soil, so if new weeds come up, you’ll have to spray them again. Systemic sprays are absorbed into the tissue of the plants like the roots, leaves and stems. No systemic spray is organic and Glyphosate sprays have been proven to not bye "locked " by the soil and become naturalised. Glyphosate should not be sprayed near wanted plants whose root systems might be touching the root system of weed. In the warmest time of the year when the temperature keeps going higher and higher and the humidity is not far behind, some plants in the garden seem to go downhill. The reason is the humidity escalates fungal problems in the garden even if you planted them the right distance apart and your chose strong varieties. Today I’m talking about some problems with the common bean. We all know our beans, Phaseolus vulgaris which belongs in the Fabaceae family. We love our beans that either grow on bushes or vine-like climbing plants. Depending on which variety you have, your bean flowers could be white, pink, lilac or purple and the bean pods can be8 – 20 cm long in any colour from green to yellow to black or purple. Common beans are warm season crops so unless you’re in sub-tropical areas, you can’t really grow them all year round. Let’s start of the bean rust which is used by the fungus Uromyces appendiculatus and first appears as small pale spots (lesions), which become yellow with a small dark centre. These spots get bigger and produce brick-red rust (summer) spores to spread the disease Infection is favoured by ten hours or more of dew or water remaining on the leaves overnight, with temperatures between 17 - 270 degrees C.
As soon as you see symptoms you need to spray with a fungicide containing copper or sulphur. 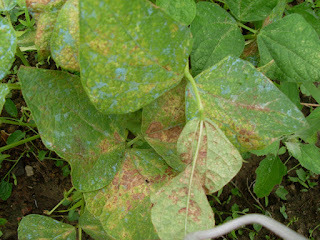 The next problem is called Alternaria Leaf spot or Alternaria alternata. 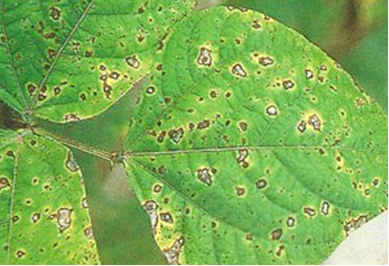 As the older areas of lesions dry out and drop from leaves this causes what looks like a holey leaf or shot hole. 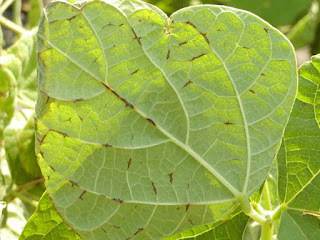 The best way to manage this problem is to plant beans in fertile soil and use a foliar fungicide that’s registered for the problem. This is a hard one to beat appearing straight away on the first emerging leaves and looks like small, dark brown to black lesions with oval or eye-shaped lesions on stems which turn sunken and brown with purple to red margin. Stems may break if cankers are bad enough so that they weaken the stem while pods become dry and shrink above areas of visible symptoms. If you’ve had anthracnose what you need to do next season is plant resistant varieties; use certified disease free seed and avoid sprinkler irrigation. Instead, water plants at the base plus remove any bean plant material. Lastly a look at something called Bacterial Blight or Xanthomonas campestris and can look like anthracnose to the untrained eye. 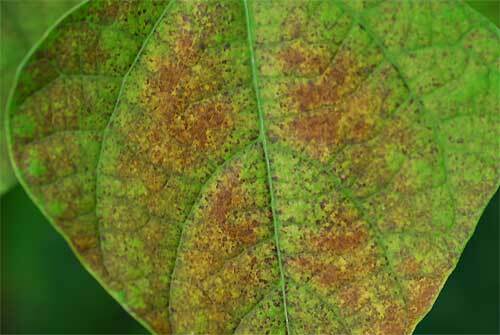 Bacterial blight looks like water-soaked spots on leaves which grow bigger and turn brown meaning a dead or necrotic spot on the leaf. The spots may be surrounded by a zone of yellow discoloration. Again, like anthracnose the spots join together and give the plant a burned appearance. Leaves that die remain attached to the plant. This disease also shows up as circular, sunken, red-brown lesion on pods, which may ooze during humid conditions. This disease can be introduced by contaminated seed, plus bacteria overwinters in crop debris. Bacterial blight likes warm temperatures and the spread is greatest during humid, wet weather conditions. What can you do if you think you have this problem in your beans? Plant only certified seed; plant resistant varieties; treat seeds with an appropriate antibiotic prior to planting to kill off bacteria; spray plants with an appropriate protective copper based fungicide as a preventative, before appearance of symptoms. Lastly, from an email, Rob says his bean plants were growing poorly, meaning they were stunted and not many beans. When I asked Rob to test the pH of his soil, he was surprised to find that it was pH 5, so very acidic. Now Rob has to apply garden lime or dolomite to bring the pH back to neutral which is around pH . Just goes to show that you can manure your garden bed, add lots of compost and still have over time, quite acidic soil. You can’t beat that pH test. Quite a few people are still not sure about whether or not they should invest in a worm far. Is it too much work, where do you put the worm farm, and will it attract vermin are some of the questions that emerge? 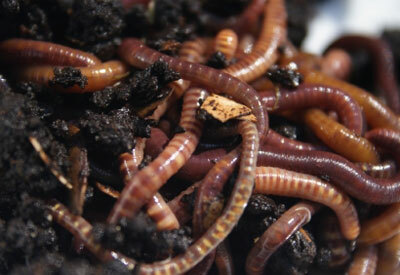 But you can get away from the fact that a worm farm is a fantastic way to minimise food waste by turning your organic kitchen waste into nutrient-rich fertiliser for your plants and soils. So how do the worms do it? Worms don't have eyes, but have areas or spots on their skin which sense light. B because worms dislike light, you need to keep them in a shady spot and covered. Worms have up to 7 hearts but if you cut a worm in two, the back half will die and possibly the front half as well. Worms start of as tiny eggs the size of a fertiliser prill. Out of each egg, 5-7 worms will hatch out. Keep your worm farm moist but not overly wet. worms don't like to dry out, but if your district experiences heavy rainfall, check the worm farm to make sure that your worms haven't drowned. We’ll continue the series next week but just to remind you that compost is a soil conditioner but worm-improved compost is a slow release fertiliser and biostimulant as well. Large trees provide lovely cool shade in the heat of summer and what’s not to love about a tree with drooping ferny leaves that keeps you cool? You see these trees on rural properties lining the driveway leading to the home, but should they be grown at all? The Peppercorn tree is evergreen and grows to about 10 metres. 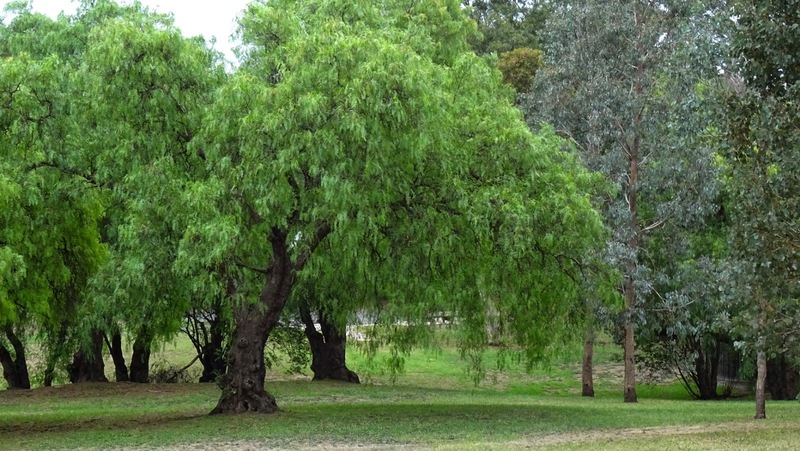 Bear in mind that this tree spreads readily by seed; is invasive in a variety of habitats including grassland, woodland and riparian areas; and is regarded as an environmental weed in most Australian states. as pepper, but are not the source of traditional pepper. 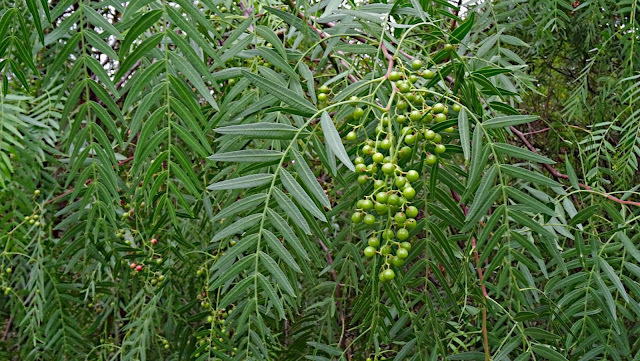 From Grow Me Instead choose an Acacia, or Eucalyptus torquata.